In 2002, Payne visited Pilgrim State Hospital, a state-run mental health facility in New York. Once the largest medical institution of any kind in the world, it had radically shrunken in size. “I wondered how a place so big, easily larger than any number of towns or major universities, could be so forsaken,” Payne writes. Out of that wondering grew an obsession. Over the next six years, Payne photographed 70 public psychiatric institutions in 30 states, from Massachusetts and New Jersey to Georgia and Texas. All had either closed or, like Pilgrim State, were much diminished in size. The closings and cutbacks, after a century or more of service, were the result of court-ordered deinstitutionalization in the 1970s. Even in their decrepitude, these places can be magnificent. 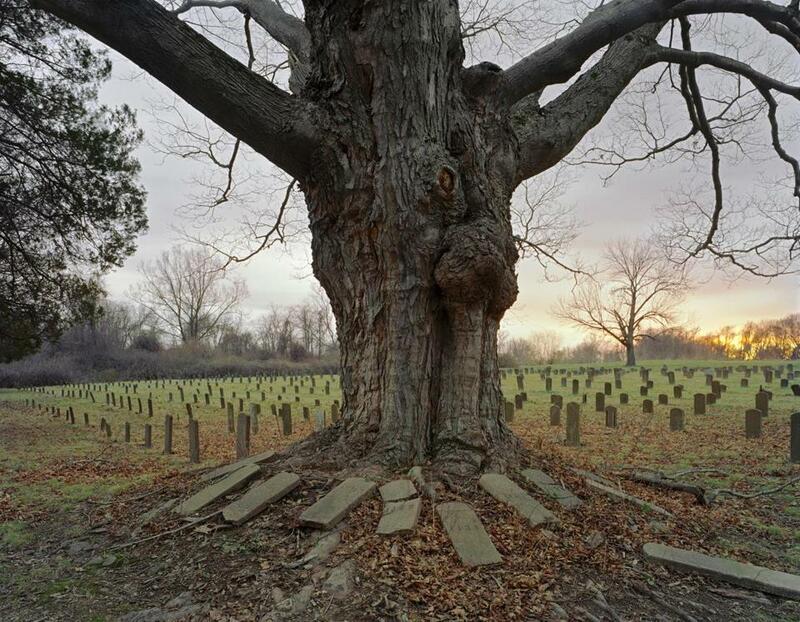 The tree that dominates the cemetery of Connecticut Valley Hospital — “presides over” might be more accurate — possesses a jaw-dropping majesty. The exterior of Western State Hospital, in West Virginia, could belong to an English country house. A marble staircase in South Dakota’s Yankton State Hospital is more palace than country house. These are images that could illustrate a fever-dream edition of Michel Foucault’s “Madness and Civilization.” Or did Foucault only have nightmares? Good as Payne is at rendering magnificence, he’s even better at banality — and incongruity. Using a soft, inviting light, he photographs a shuttered beauty parlor, stored bowling shoes, abandoned luggage, empty corridors that become studies in Renaissance perspective. Stephen DiRado’s “Rebecca” (far right). 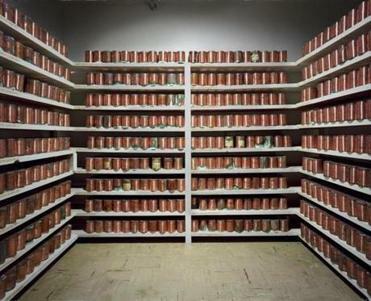 Its caption turns a photograph of what looks to be several shelves of neatly arranged paint cans — a single-frame study in serial imagery — into something heart-breaking instead, “Unclaimed Cremation Urns, Oregon State Hospital.” Or there’s “Patient Toothbrushes, Hudson River State Hospital, N.Y.” Those skinny rectangles of childish color jump out from their beige background and the peeling white paint that frames the case containing them. Look more closely, and something else stands out: the label on the back of each brush bearing the name of the patient it belonged to. Describing his visits to these mostly abandoned sites, Payne writes, “There was no obligation to take out the trash, and yet I found myself doing so out of respect.” That respect can be felt in every square of inch of these images. Although many ghostly presences populate “Asylum, no people are visible. Only their artifacts are. Stephen DiRado’s “Bare” is all people — and an absence of artifacts. 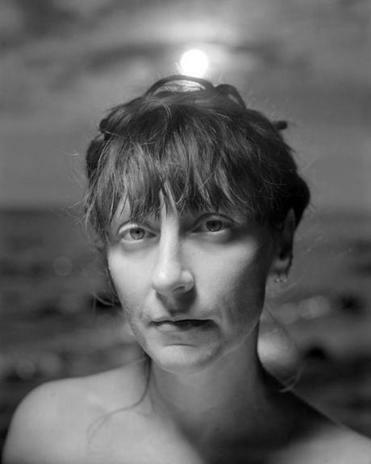 It consists of 20 nudes, shot on Martha’s Vineyard beaches over the past 15 years. The photographs are black and white and small (9½ inches by 7½ inches, or vice versa). The one exception is Helmut Newton-big: 40 inches by 50 inches. But that very bigness emphasizes how unlike Newton’s these nudes are in their matter-of-factness and, for lack of a better word, normality. Some of the photographs include couples. Others just show torsos. Most are individual portraits. All of the sitters (well, actually, they’re lying down or standing) evince a complete comfortableness in front of the camera. The images aren’t sexualized or stylized or otherwise exaggerated. Such naturalness makes the sight of so much casually unclothed flesh — young and old, black and white, male and (mostly) female — seem all the more miraculous viewed amid a New England January.